– Suleman Alli, director of strategy at UK Power Networks. – Paul Massara , CEP of North Star Solar. The principal legislation governing the UK electricity market, the Electricity Act 1989, makes no specific reference to electricity storage, however storage has traditionally been treated as a sub-set of generation on the basis that it can discharge or provide electricity. This means that unless an exemption applies, storage providers generally require a generation licence to operate. It also means that transmission and distribution network operators are restricted from owning storage assets. Generation licence holders are required to comply with the Grid Code, however small generators are exempt from this requirement, and most storage operators are small enough to qualify for this exemption. 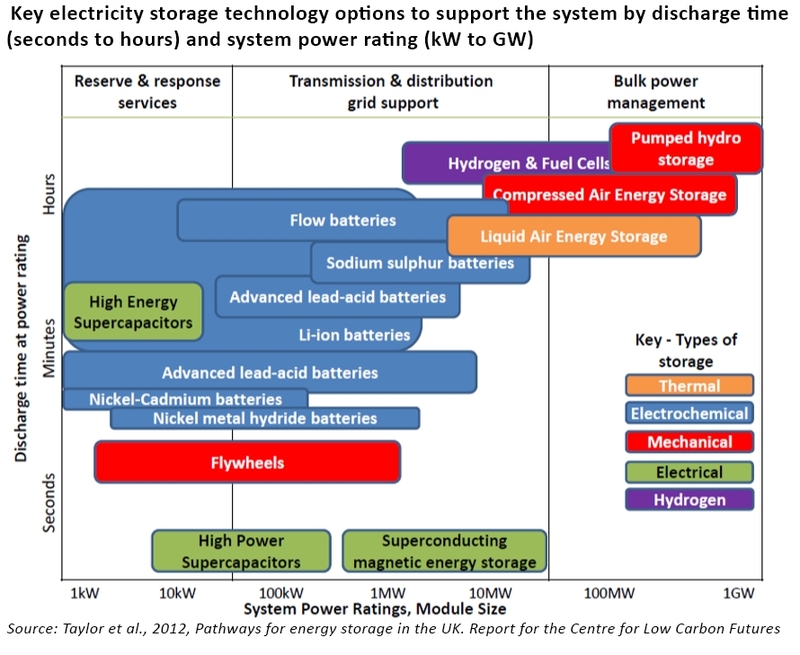 Ofgem is currently consulting on different business models to facilitate electricity storage, looking at whether storage should be seem as a service where system operators contract the storage service form third party owners, or storage as an outsourced operation where network operators own the storage asset and third parties contact for management of the asset and provision of ancillary services. This paper by the UCL and Birmingham Energy Institutes argues that system operators are best placed to maximise the utility of storage in balancing the system, and that the deployment of storage could reduce or delay the need for network reinforcement. The authors believe that business models can be constructed that enable storage ownership by system operators without introducing anti-competitive market behaviour. However, other economic models such as co-location with renewable generation, could provide system benefits and there is a risk that system operators would take too narrow a view of the value of storage assets and not fully exploit their potential contributions. Although if they did seek to exploit other income streams, they would benefit unfairly from the regulated return they earn on the primary, regulated function of the asset. 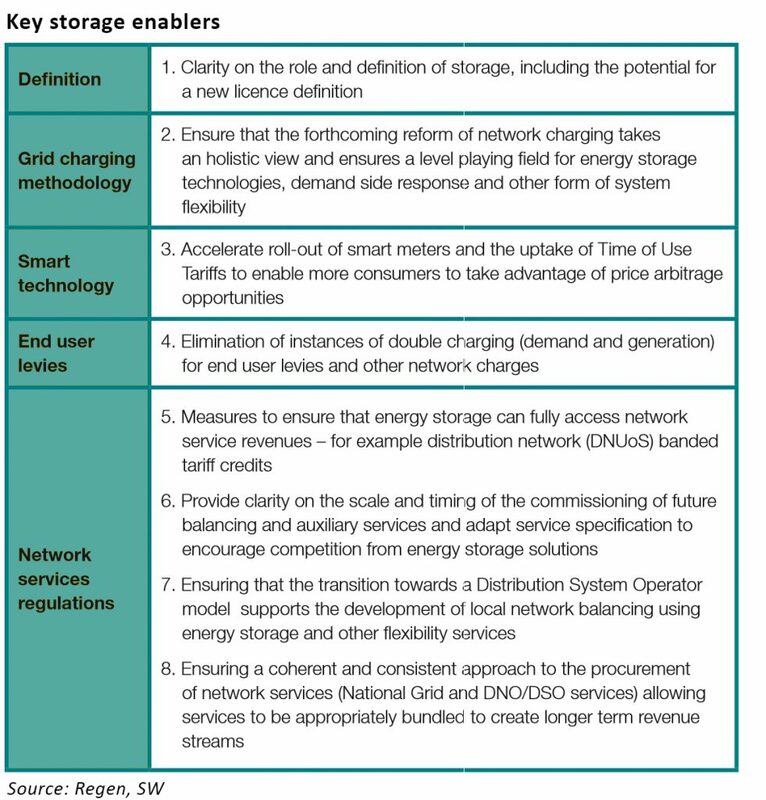 Ofgem has previously argued against system operators owning storage on the basis that it could be anti-competitive, a view shared by the Policy Exchange, which points out that as network operators are monopoly businesses within their area of operation, direct ownership of storage by network operators would mean they effectively buy a network management service from themselves, rather than through any form of competitive process, with the cost passed on to consumers. 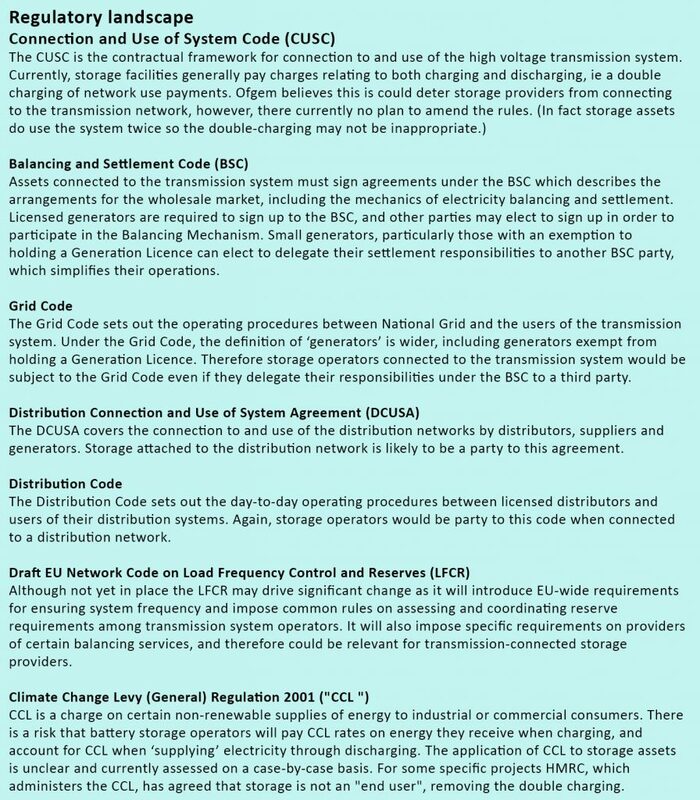 Other commentators have pointed out that National Grid already contracts for various services that support grid stability and argue there is no fundamental difference between storage as a service and other types of gird services. Distribution System Operators could be offered similar abilities to contract for storage services without the need for direct ownership. A challenge with the storage as a service model, however, is the inherent conflict of interest whereby system operators earn revenues from building and maintaining network infrastructure and the existence of storage threatens this by making network investments less necessary. This means system operators could lack the fundamental incentive to contract for storage services in the first place, making it difficult for storage owners to access the market, or fully exploit the economic potential of their assets. Earlier this year, Ofgem and BEIS decided not to require the system operation function of National Grid to fully separate to create an ISO, however stronger separation of the SO and non-SO functions was mandated. In this context, it would seem counter-intuitive to allow National Grid and DSOs to own electricity storage – to do so would effectively redefine storage as a transmission asset rather than a generation asset. In fact neither definition reflects the full potential of electricity storage in providing capacity and flexibility to the system. To maximise this potential, the Electricity Act should be amended to create a more bespoke and appropriate definition for storage assets, but taking care not to impose in-necessary regulatory obligations. In-reasonable double-charging should be removed, however, storage assets should not be exempted from double-charging for use of transmission and distribution systems since they do indeed use these systems twice when charging and discharging. Finally, care needs to be taken to ensure that system operators make full use of storage as an alternative to network expansion or reinforcement investments. This could be solved by separating system operation from system ownership – the SO could issue tenders for the required network capacity, and select the most cost-effective solution across storage or transmission infrastructure. Perhaps an the decision on an independent system operator needs to be revisited after all. Of course, if we didn’t have any expensive intermittent renewable energy on the grid, we wouldn’t need to add even more expensive storage.